In 2014, Bourn Hall was one of the first clinics to introduce the new Early Embryo Viability Assessment (EEVA), which helps embryologists select those embryos with the highest potential at an early stage. There are many factors that contribute towards successful IVF and identifying viable embryos is one of the most important. In a traditional incubator, the embryos are removed at intervals and inspected to see how they are progressing. Embryos that divide evenly and reach the 5-day blastocyst stage are considered to be those most likely to achieve a healthy pregnancy. Early Embryo Viability Assessment (EEVA) test provides the embryologist with more information it takes photographs at regular intervals and uses an underlying calculation to predict which embryos have the greatest chance of reaching blastocyst. It is a scientifically and clinically proven test to help identify viable embryos at an early stage (Day 3) without disrupting them. Embryos are placed in a Geri incubator system, with patient-specific embryo culturing chambers and a camera monitors their development continuously. The benefit is that there is less disturbance to the embryos, which are kept in an environment as close to natural as possible. For EEVA is an additional aid for highly skilled embryologists and may be offered when considered appropriate. This video from 2014 provides an introduction to Eeva, with comments from Adam Burnley, Bourn Hall’s Lead Embryologist. Anastasia and Thomas started trying to have a baby as soon as they got married, but, after a year with no success, they went to their GP. Their tests diagnosed ‘unexplained infertility’. 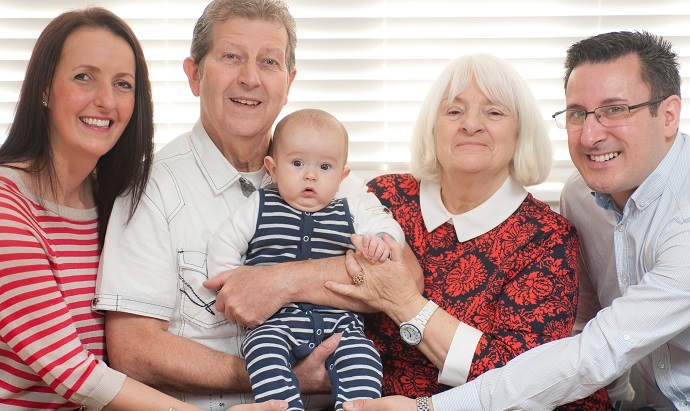 A few months later the couple had their first appointment at Bourn Hall and, after some more tests, the consultant decided Thomas’ sperm motility could be the cause of their infertility and suggested IVF with ICSI (Intracytoplasmic Sperm Injection). However, in 2009 the funding criteria for IVF in the East of England changed and the couple were entitled to a further two fresh and a further three frozen cycles of treatment. Sadly all 5 cycles were unsuccessful and the last ended in miscarriage just days before the couple’s 7-week scan. This also marked the end of the NHS funding. The couple took some time to grieve and think about their future. 11 years on from first starting to try for a baby, Anastasia and Thomas started treatment knowing that this was their last chance. The couple decided to have IMSI (Intracytoplasmic Morphologically Selected Sperm Injection), which has been known to boost success rates for cases where implantation hasn’t worked on several occasions following ICSI treatment. IMSI involves the assessment of sperm at a very high magnification, allowing embryologists to identify any defects or abnormalities. Once a sperm is selected it is injected into a mature egg in the same way as standard ICSI. Anastasia and Thomas also opted to use EEVA (Early Embryo Viability Assessment), which takes pictures of the developing embryos inside the incubator every five minutes. Thankfully, this time, Anastasia and Thomas had no need to be nervous. On the 28 May 2014 baby Hugo was born. Find out more about Eeva on our website here.